I really enjoyed all of the meals except the pesto quinoa bowl. Not my favorite. I love quinoa, basil, and spinach, but the flavor combination wasn’t ideal for me. I LOVED the Blueberry Bombshell smoothie and honestly looked forward to drinking it after my AM workout. The K&Kale salad was also delicious, but I started to get bored of it mid-week so I switched to balsamic dressing instead. It helped a little, but next time I may plan two different lunch options so I don’t feel like I’m forced to eat the same thing over and over again. This was my fault though, because the nutrition plan DOES encourage you to switch up your M3, I was just trying to save $ and time by only prepping one. 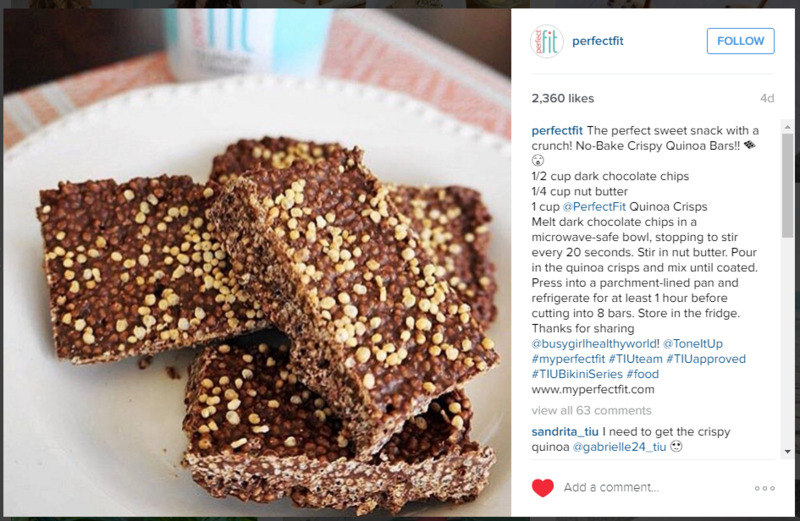 I did also eat my No-Bake Crispy Quinoa Bars (which were reposted on the PerfectFit Instagram and are officially #TIUapproved!) if I was craving a sweet snack at the end of the evening- which was three times during the first week. DESSERT IS OKAY during the bikini series as long as it’s not all the time- see page 81 of the nutrition plan if you have it! My husband is NOT following the diet plan. I thought this would be tricky and I didn’t want to make two separate dinners each night- so I didn’t. It was surprisingly easy. To make these meals more filling and appropriate for him, I added grilled chicken and potatoes for him to eat with the quinoa bowl on Monday and Thursday, added grilled potatoes to his meal on Tuesday, made baked chicken with taco seasoning to turn the Mexican plate into chicken tacos (so he also had tortillas and cheese), made a burger for him Thursday and he had the quinoa bowl as a side dish, and served the mexican plate over brown rice for him on Friday. Essentially, I tried to add more carbs and protein to his meals. I also made him a baked whole wheat penne dish for lunch so that he got some additional carbs and calories at lunch time. Honestly, the hardest part of week one has not even been waking up for the workouts. My alarm goes off and I just get up-no snoozing it at all. I also generally walk my dog, River, for 10 minutes every morning and 20 minutes after work, so that added on some active time to each day. 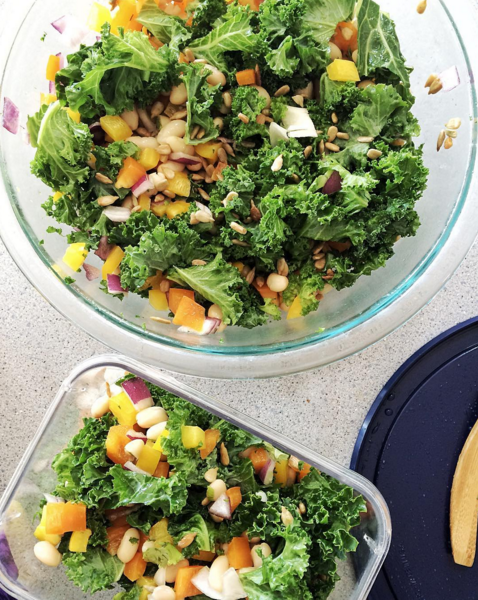 I eat healthy foods regularly, but prepping my meals ahead of time (although time-saving), also makes me feel trapped because I can’t vary what I have planned out of fear that if I don’t eat it when I am scheduled to, it will go bad. It’s also difficult because no matter how much you like a meal, sometimes you are just not in the mood for it. My plan for the rest of the challenge is to have some alternative foods in the house that are acceptable to eat in case I feel like switching it up. For instance, if I’m planning on eating celery with peanut butter for my M4, I will also make sure I have some trail mix or a TIU-approved bar around just in case I am not in the mood for celery and peanut butter. I also think I might not shop and meal prep for the WHOLE week, but maybe just a few days. This means more time spent mid-week shopping and prepping again, but it also gives me an opportunity to switch up the meal plan and buy different foods if there is something I’m sick of or if I’m looking for a change. My plan for next week is to get my shopping and prepping done on Sunday for Mon-Wednesday and then Wednesday night shop and prep for the rest of the week. That way my food is always fresh and I’m not wasting food if I’m not feeling it. Good news is that I don’t really feel hungry on the plan and the amount of food I am eating seems to be working for me. I have enough to feel satisfied but not enough to feel “full.” My stomach has also been feeling flatter in general. I’m sure that’s due to eating more veggies and fruit and less starches. I’m also drinking more water because my morning workout gets my body moving and I’m thirstier throughout the day. Drinking water is something I struggle with, but I’ve noticed a significant increase in the amount I am drinking over the past week. The workouts are absolutely wonderful. I am in love with all of the Tone It Up workouts and I always feel challenged throughout the entire video. If you feel them getting easier for you to complete, you just increase your weights and it feels challenging again. I love that they have workouts for literally every different major area of your body as well as cardio workouts. 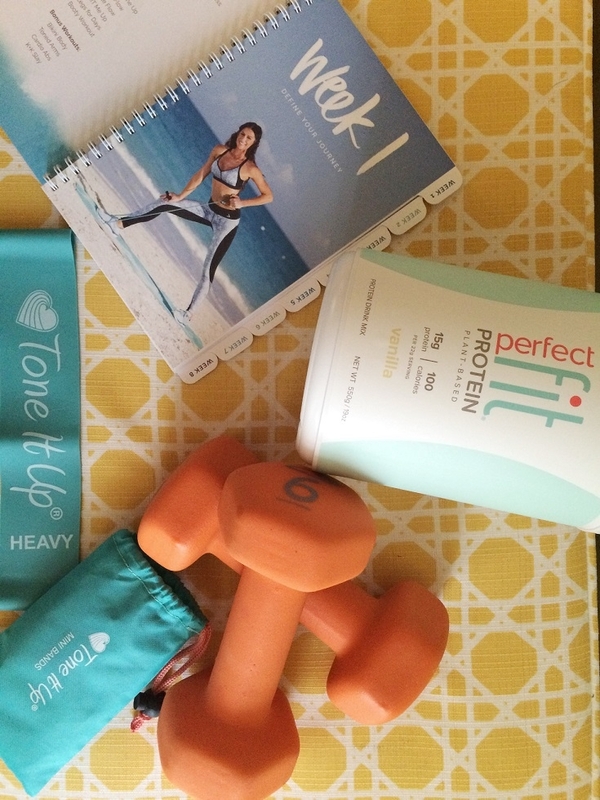 When I first started Tone It Up, I HATED the HIIT workouts because they were SO difficult for me. Now, they are my favorite. I feel like the HIIT workouts are even helping me with my running because I’ve been able to run further and faster than I previously was able to (this could also be because River has been joining me on my runs and he pulls a little so we are moving quicker than I would be on my own :)). If you’re not looking to do the whole program, but are interested in some really great workout options, you can purchase the Beach Babe 4 workouts on the Tone It Up website.